Happy Solemnity! This is a day to celebrate! Today, we honor the glorious and miraculous Immaculate Conception of our Blessed Mother, an act of God’s most profound mercy. It is fitting that we see the Immaculate Conception as an act of profound mercy. Why is that so? What is it about this solemnity that is so closely linked to mercy? Mercy is a gratuitous gift of God. By “gratuitous” we mean that it is not merited or earned. Mercy is not owed to us by God. If it were, it would not be mercy, it would be our right. But we have no right to mercy. It is freely given by God and it is given in abundance. As for this glorious Solemnity of the Immaculate Conception, it’s important to look at it as a gratuitous gift from two perspectives. 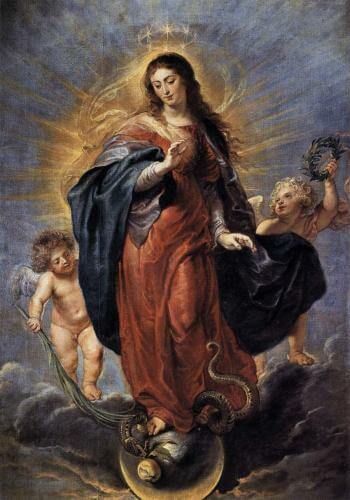 First, the “Immaculate Conception” means that when God created the Blessed Virgin Mary, He created her without sin. This was done through what we call a prevenient grace. This grace given her is an act of God’s perfect and gratuitous mercy. She did not earn it or merit it; rather, God in His goodness chose to create her without original sin so as to have a suitable instrument by which the Son could come into the world. Mary, for her part, embraced this gift and chose to remain sinless throughout her life by a continual act of her free will. Second, in creating our Blessed Mother immaculately, God did not keep her to Himself. He was not selfish with her. Instead, He chose to make this perfection of His creation our own mother. The Immaculate Mother Mary is now our spiritual mother in the order of God’s grace and mercy. This, also, is an act of perfect gratuitous mercy on the part of our loving God. We do not deserve such a spiritual mother and protectress, but we have her and she is always there interceding for us and bestowing many graces from God upon us as a perfect mother would. Reflect, today, upon this twofold gratuitous gift of God’s mercy: 1) He created Mary Immaculate out of mercy, and 2) He gave her to us as our own mother and queen. Seek her motherly care today and throughout the year! Dearest Mother my Queen, I gaze upon the beauty and holiness of you who, though a mere creature, are perfect in every way. You have been granted this singular and gratuitous grace from God with which you perfectly cooperated. May I always rely upon your motherly love and care and may I always allow you to bestow the grace of God upon me in accord with the Father’s plan. You, dearest mother, are a gratuitous gift of Mercy to us all! Mother Mary, I love you. Pray for me. Jesus, I trust in You.